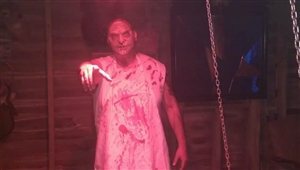 DelawareHauntedHouses.com recently sat down with Terry Scott of Slaughter House Farm, to discuss what's new at Slaughter House Farm for the 2016 Halloween Season! Located in Laurel, Delaware, Slaughter House Farm does a scary-good job at frightening their visitors with their brutally macabre atmosphere. The farm is located right off Route 13 and is the ideal setting for a terrifying Halloween experience. Once this farm is transformed, it becomes infested with creatures that are complete with chainsaws and shot guns, among other hair-raising props that are used to terrify all those who enter. The haunt begins with a journey through the garages, then you'll be forced into a haunted corn field known as Stalkers Field. Once you've braved the field is when you truly enter the barn known as Slaughter House Farm. Beware as this attraction usually takes 50-60 minutes to complete - that is if you make it all the way through! What's new at Slaughter House Farm for 2016? Do you have any new rides, attractions, or special features that Haunt Seekers should know about? As always Slaughter House Farm looks to step up the scare in 2016! Slaughter House Farm changes each year to confuse our victims! Several areas will have new water features installed for your screaming pleasure. New scenes are being constructed each week at the Slaughter House! Our monsters are most excited about the new victims that will come our way! As the word spreads Slaughter House farm becomes a must see destination. What differentiates Slaughter House Farm from other local haunts in Delaware? We have some of the best actors in the business! The difference is our actors are all volunteers. We run Slaughter House Farm to support our military by supporting Operation We Care. When you attend our attraction you are supporting sending care packages to our soldiers. How long has Slaughter House Farm been in business? Can you tell us a bit more about Slaughter House Farm's history? This is Slaughter House Farm fourth year in operation! The Scott family created Slaughter House Farm to help support Operation We Care which sends care packages to our soldiers along with other local charities. What's your favorite experience since opening Slaughter House Farm? Our favorite experience since opening Slaughter House Farm is hearing the screams, laughs, and comments our fans make as they exit the attraction. Our Fans are number one with us! How long is a typical haunt experience at Slaughter House Farm from start to finish? How long is Slaughter House Farm? It depends on a few things... How much you run... how much you become paralyzed with fear... and how long our monsters want to play with you. In short approx. 40 to 55 minutes. On a scale from 1 to 10, how scary would you say Slaughter House Farm is? Why? Slaughter House Farm is a ten (10). With the amount of different situations our victims are put in we guarantee you will be screaming! Does Slaughter House Farm's property have any real haunted history? Do you have a spooky encounter you'd like to share? We have indeed scene some pretty weird stuff happen around the farm when the crowds are gone! We have even seen things happen when the crowds are going through Slaughter House Farm. At times there seems to be an additional farm hand working that lets just say should not be there! Once again our favorite part of the business is our fans. We have a great following and for good reason. We give them what they want... A screaming good time! How has new technology (i.e. animatronics, special props, etc) helped you to enhance Slaughter House Farm? Slaughter House Farm does not use a lot of animatronics. We believe that the best scares come from the living or half living. Can Slaughter House Farm accommodate large groups? How many people can experience Slaughter House Farm together as a group? Slaughter House Farm takes groups of ten to twelve at a time. It works best for us and our victims! Does Slaughter House Farm offer any special deals, discounts, or coupons? Anything else you'd like to let us know about Slaughter House Farm? 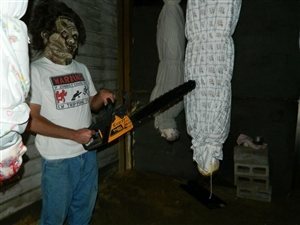 Plain and simple Slaughter House Farm specializes in creating HORROR! Slaughter House Farm is thrilled to open their doors for the 2016 Halloween Season and are prepping ahead of time to assure the maximum level of scares!